Who can agree to the saying that during the last ten years (maybe more) the Scandinavian countries are the best Metal producing well? I have written these words in many other album reviews that I think I am just repeating myself. On the other hand, this is a fact that cannot be treated lighthearted; this part of Europe seems to be on a constant creativity fever giving birth to many good and interesting bands. 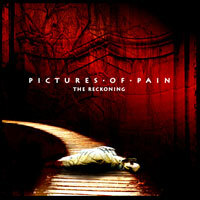 PICTURES OF PAIN, hailing from Norway, fall into this category and “The Reckoning” is their debut release that manages to surprise the listener from the first CD spin. Indeed, the clean guitar arpeggios of the album opener “Betrayal” seems to be working on some early ANNIHILATOR influences but this impression last until the high pitched vocals have entered. Hans Helge Iversen has an impressive voice with many different timbres that is some extent justify the term ‘progressive’ used in the music description in the band’s bio sheet. Even though, this track goes through a lot of changes in the tempo and the heaviness it stays focused without giving the overloaded feeling most of us are getting in progressive Metal releases. Despite the young age, PICTURES OF PAIN seem to have a most original music identity passing through many Metal territories, maintaining a solid character that is dominated by the aforementioned vocals and the very good guitar work. Actually, this guitar work with the catchy hooks and the killer fast riff breaks made me think of CONTROL DENIED and again of the ANNIHILATOR’s “Alice In Hell” days. A fine example of this saying is the killer “Deviator” where the solid rhythm section and the high pitched singing are some of the Thrash/Death Metal virtues that shine here. I also managed to spot some “Icon” based PARADISE LOST references in the slower tracks like “Sign Of Times” and in the guitar leads of “Final State” among others. There is no doubt that PICTURES OF PAIN have a most interesting proposition in “The Reckoning” that is packed with many ideas and styles. Of course, they need to work on their style and avoid getting lost among all these different influences that are currently kept under control. This is a release that deserves to be in the rookie best album 2010 release list.